Amnesia: Memories is the PlayStation Vita rerelease of Amnesia (アムネシア, Amuneshia? ), a PlayStation Portable adventure game released only in Japan on August 11, 2011. It is the first in the Amnesia series of otome games, developed by Otomate and published by Idea Factory. 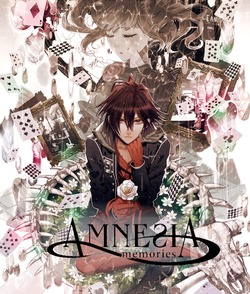 Memories was initially released in Japan on December 19, 2013 as Amnesia V Edition (アムネシア V.EDITION, Amuneshia V Edition?). On August 25, 2015, four years after the game's initial release, it was localized in the west by Idea Factory International on the PlayStation Vita and Steam. A free-to-download version was also released on iOS and Android, though the routes can only be fully-unlocked through payments. Amnesia plays like a typical otome visual novel; you play as a young female protagonist and must make choices in order to progress the story. These choices can lead you to a specific ending (good, bad, or normal) with one of five male characters. However, it is unique in a few key ways. Firstly, the protagonist rarely speaks, with most of her dialogue being comprised of the choices you make. While a self-insert protagonist isn't unusual for an otome, her thoughts and actions are narrated by a spirit named Orion, who will frequently make comments of his own regarding the protagonist's situation and love interests. Secondly, the different characters' routes do not take place in the same world, but in parallel universes, each represented by a card suit (Heart, Spade, Clover, Diamond, and Joker) that also represents the love interest associated with that universe (Shin, Ikki, Kent, Toma, and Ukyo, respectively). Therefore, details of the protagonist's life preceding the accident that kicks off the story change depending on the world that is chosen at the start of the game. In addition to including all five routes present in the original release, Amnesia: Memories adds short stories (appropriately referred to as "Memories") for each character, unlocked after completing their routes. These short stories take place at certain points within the main story, and thus focus on the romance between the protagonist and love interest rather than the plot. Two mini-games that utilize the Vita's touch screen were also added (Rock, Paper, Scissors and Air Hockey). Any of the five love interests can be chosen as a competitor in these mini-games, though there is a progression in difficulty from left (Shin) to right (Ukyo). On PlayStation TV, the mini-games are instead played using a combination of the analog stick and a face button, and on a computer, they're played using the mouse. The game begins with the heroine losing her memory due to a collision with a spirit named Orion, who obtains a mental attachment to her (resulting in her being the only person able to see or hear him). Orion believes they can only separate if the heroine regains her memory, which can only be done by traveling back to her world and making choices that may result in the recollection of her past. The existence of parallel universes makes this task more difficult, requiring the heroine to utilize different methods in each of these universes in order to collect the information she seeks. This page was last edited on 28 December 2018, at 03:35.